finding positivity in my favorite animal. In light of recent events sweeping our nation, it is important to me and to a lot of people to try and find some positives within our own life to reflect on. 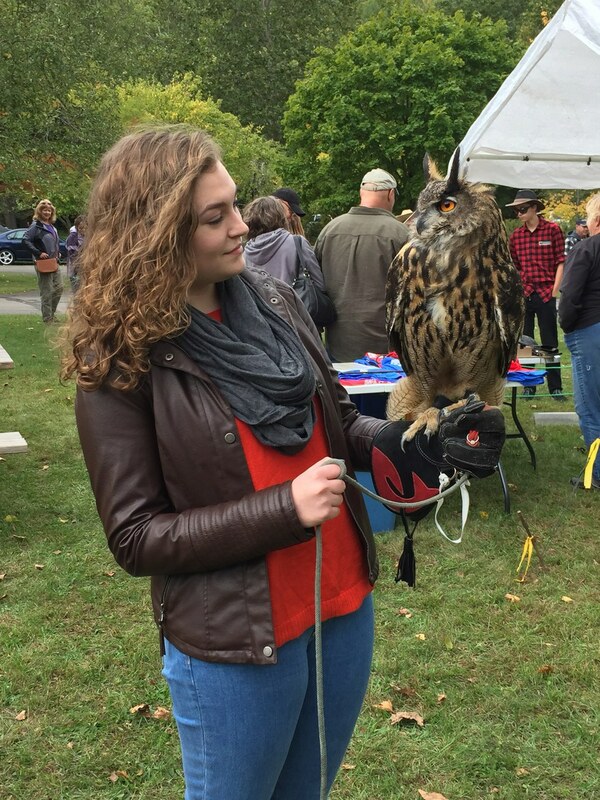 Mine just so happens to be the living out of a lifelong dream of getting to hold an owl. This may seem like an odd thing to dream of doing, but from the start owls have been a big part of my life (I was a weird kid, what can I say?). 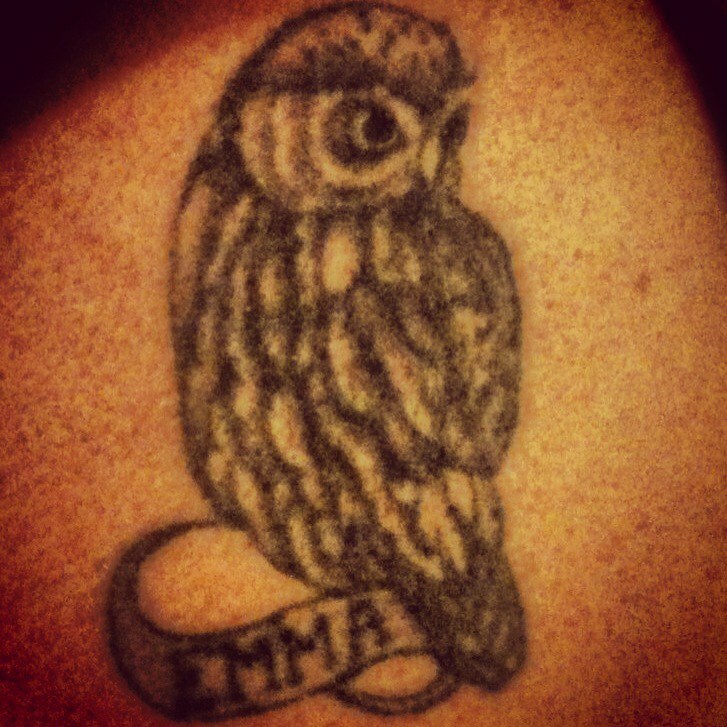 When I was little, my dad got a tattoo of an owl perched on a scroll with my name on it. This would be "my tattoo" growing up. Owls symbolize wisdom and knowledge, both of which I hold as important factors of my life. When I was younger I strived to learn all I could, reading copious amounts of books in record time, and as an adult I still have a drive for gaining knowledge and wisdom of the world around me. Thus, I feel that my life is personally connected to what an owl represents. Then however, came the obsession with getting owl themed items. I had stuffed animals, jewelry, pillows, pictures, drawings, etc. all of owls. This obsession has dwindled substantially as I became slightly overrun with the theme, however it did not diminish my fondness for this bird. 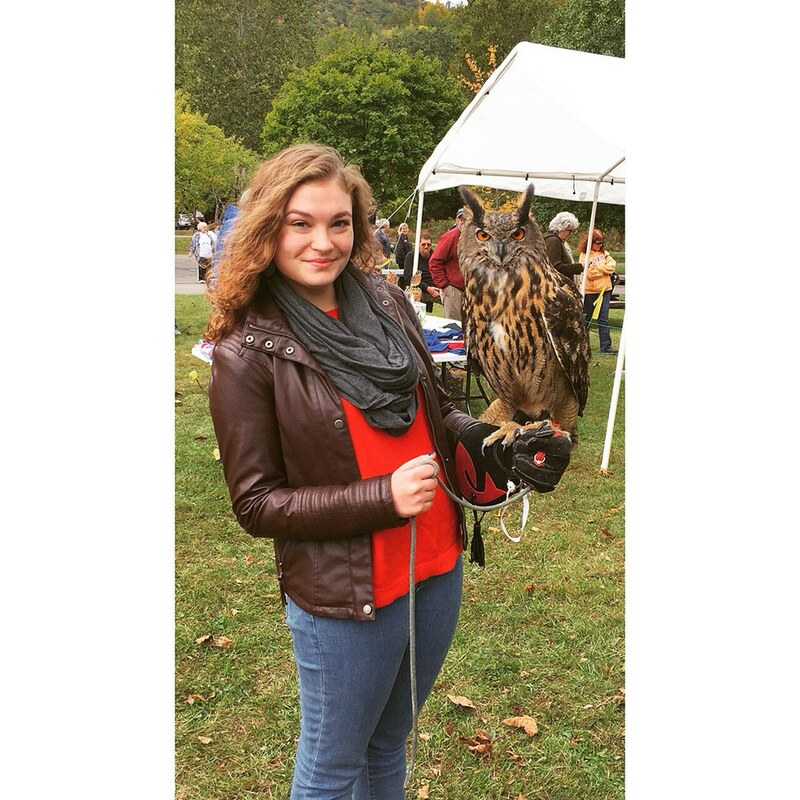 I would go to aviaries growing up and seek out the owls, listen to the woods at night to hear the faint hooting in the trees, and read books about the various kinds of owls in the world (216 species to be exact). As I grew older I always wanted the chance to actually hold one for myself, and of course I wanted one as a pet at one point, but I realize that is out of the realm of possibility now. When I was eighteen and working at a zoo, a keeper let me pet a small screech owl and, well, I cried. This might not have been my finest moment but I was so excited by just getting to be that up close with my favorite animal. Fast forward to a few weeks ago. While visiting my boyfriend in nearly the middle of Pennsylvania, we decided to explore a fall festival in the neighboring area. After attending this festival we drove past a sign saying another fall fest was right up the road. Without planning, we decided to see what this one had to offer. Hoping for some food or maybe live music we went to what can not really be considered a fall fest but just a few informational booths set up along a dam. We decided to check it out anyway and while walking along I almost didn't notice that massive owls and other birds of prey were on display at one of the stands. It was a booth advocating for a birds of prey sanctuary, and they brought some of the birds they use in educational settings to be seen. My eyes fell on one owl in particular. He was massive, and had bright orange eyes. 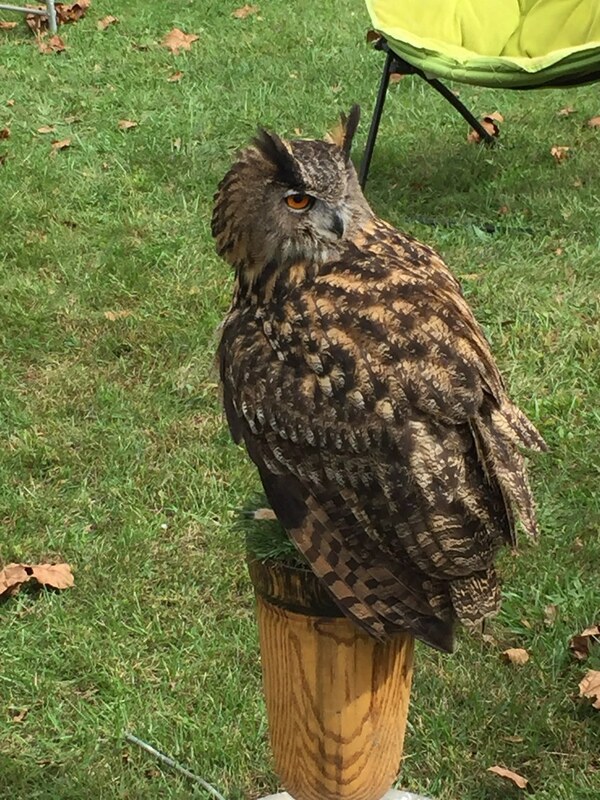 He was an eagle owl, one of the larger species. I was enamored and then I realized I would be allowed to hold him. I went up put on a safety glove and watched as the man wound his harness around my fingers so he wouldn't fly away. Then with one shift of his wrist Owlexander (his name of course) hopped onto my arm and looked at me. It was a moment I will not soon forget. As we looked at each other, my heart felt full. This was a moment I had waited years for and it had now become a reality. I felt like a little girl again imagining being able to do this, and I was truly happy. So, regardless of the negativity surrounding our nation at this time, reflect on a moment of pure happiness in your own lives, as I did with Owlexander. Maybe it will help inspire you that a better tomorrow will eventually come.